Until two years ago, I’d never heard of the Nilgiris myself. And the only reason I got fascinated with them was because of a Bollywood movie (which is basically the reason why I get fascinated with anything really). Nilgiris (which translates to Blue Mountains) are a gorgeous mountain district in the South Indian state of Tamil Nadu. A friend of mine owns vineyards in the Nilgiris (pretty baller, right?! ), in a small village called Kookkal. I’ve visited vineyards in Tuscany before, but never in India, so I was pretty excited. We planned a girls-only weekend to her estate, nestled between the mountains, to get away from the hectic Bombay life and soak in some nature. What’s so great about the Nilgiris, you might ask? It’s GORGEOUS! Expect to see tea-carpeted hills, coffee estates, and maybe even some wild animals (tigers, leopards, panthers and bisons roam freely!). 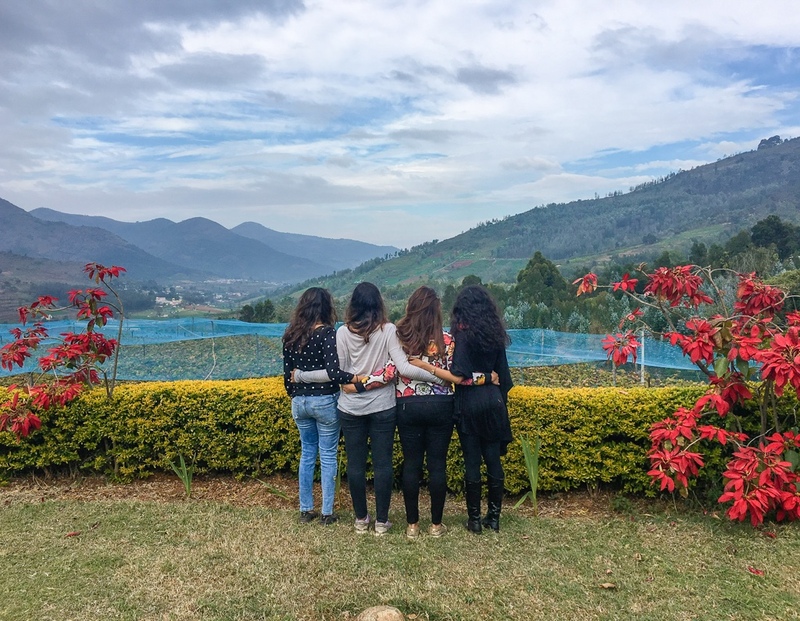 The Nilgiris are a hidden gem, even amongst Indians, and the closest people get to visiting that region is traveling to a small town, Ooty (okay, nothing is really small in India, but we’re talking relative here!). But the Nilgiris’ real beauty lies away from the towns, in the blissful silence of the mountains. We flew into Coimbatore, and got ready for a 3-hour drive through the mountains, up 5000 feet. I always get really car sick, so having incredibly winding roads didn’t help 🙁 I definitely couldn’t enjoy the views as much as I would have liked. Because they were STUNNING! We got to my friend’s house just in time for afternoon tea. No Indian winter is complete without a steaming cup of chai and deep fried snacks! The air was crisp and chilly (between 5-10 degrees Celsius), which always comes as a welcome relief to those of us who live in hot and humid cities like Bombay. I was SO incredibly excited to put on my sweatshirt and warm, fuzzy socks – things I had packed away ever since I left New York. I literally bought 5 sweaters for a 2-day trip just because I was THAT excited for winter wear. We spent the rest of the evening walking through the vineyards, reading and coloring (therapeutic beyond belief when you’re in the mountains), and making some mulled wine, all while getting constantly distracted by the views. I couldn’t read more than a few paragraphs without stopping to look up from my book every few minutes. Omg – have you ever seen anything like this before?! The next day, we did a bit of exploring. After a delicious home-made South Indian breakfast of idlis and vadas, we drove about an hour and a half to the Culinarium, a really popular restaurant for European food in the area. Seems kind of random, right? But believe it or not, the Nilgiris has started attracting a lot of foreign tourists. The food was average for vegetarians, but my friends had the pot pie, which they said was even better than what they’ve had in London! They also have a pretty vast selection of desserts and pastries, which we packed up for some midnight munching. All breakfasts should look like this! There were two other spots that we wanted to hit up. A Chilean lady called Marcela runs a little bed and breakfast, with an attached café, overlooking tea gardens. The Point Café serves baked goods and pastries (including eggless ones – IMAGINE MY DELIGHT!! ), homemade tea and coffee. It has fantastic reviews! Make sure you call in advance though. These are small businesses in the mountains, and they operate at their own schedule. Sadly, Marcella was traveling when we visited, but I’m definitely going there the next time I’m around. So, we went to La Maison – an incredible homestay run by a 70-something French man. Consider staying there if you ever visit. It’s a charming house, overlooking tea gardens and serving fresh-from-the-farm food. We sat in his backyard for two hours, chatting to him about his life and what brought him from France to the Nilgiris; all while enjoying some homemade bread and jam, with tea. What a wonderful afternoon! It’s experiences like these that make travel truly enjoyable and meaningful for me. I love speaking to people, learning about their lives, their backstories. It makes you realize how small you are in the universe, and how many stories are unfolding every minute. It opens up your horizons, one exchange at a time. I’ve realized you don’t have to travel to far-off countries to have experiences like this! This can happen in your own city! How beautiful is his home? We spent the rest of the night at the house, bundled up in layers, just being… how often do we do that? Just stop to BE. Not do anything. It’s hard with the fast-paced lives we live, to truly take some time to pause and reflect, or just give yourself a break. Honestly, we weren’t ready to leave the next day. It’s a pity we don’t give ourselves more time on vacations like these, where you have no agenda and you’re just amidst nature. We always think 2 days will be plenty. BIG MISTAKE! These are probably the kinds of vacations we should give more time to. The four of us decided we’d come back during the next harvest season, but for more than just a weekend. For our final day in the mountains, we had an authentic South Indian meal. It consists of plenty of curries and vegetables, spread out on a banana leaf, all to be eaten with rice (and your hands!). It’s sad that I live in India but had never had an authentic South Indian meal, complete with banana leaf et al, before, even though I’ve visited Kerala (another popular spot where you’re likely to encounter a full spread banana leaf meal). To access the Nilgiris, you can fly into Coimbatore from any of the major cities in India. There are several small towns in the Nilgiris. Ooty is the biggest, but there’s also Kotagiri and Coonoor. Book a homestay or B&B for a more authentic and relaxing experience. There’s plenty of things to do including hiking trails and tea plantations. The weather is beautiful year-round. Winters (Dec-Jan) can get a bit chilly, and the monsoons (Jun-Oct) can be pretty severe (although still gorgeous). Wow, so tempting. Would love to visit this wonderful place .